Snap fit slatz stand into reverse side of faceplate (bottom edge). Sign is made from anodised aluminium. Sign comes complete with black ends caps and stand. The slatz concept is one of simplicity and versatility providing a total interior sign programme in one system. 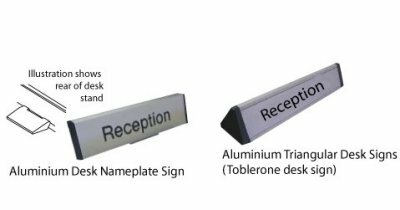 Slatz signs, whether a single self-standing desk top sign, a double-sided suspended directory, or a complete store guide, can all be created from a small number of components. The extruded aluminium slatz facesplates to which graphics can be applied in a variety of ways are totally interchangeable and obtainable in different depth sizes, all of whicj h conform to a basic modular format, allowing a virtually limitless combination of faceplate sizes within a directory. Additional curved and square slatz are available for completing both the top and bottom of directories.